Bass guitars are versatile instruments. They fit in with almost any style of music, including R & B. R & B (rhythm and blues) originated in the late 1940s and is often referred to as “R & B/Soul.” It’s still one of today’s most popular styles of music. R & B is dominated by session players — musicians who record with numerous artists. Often, record producers hire the same rhythm section (session players) to accompany all their artists. So you have the same bassist, drummer, guitarist, and keyboardist playing together for years and years on countless sessions with different artists. It’s a sure recipe for some serious rhythm section interplay; these cats know each other’s playing style. Tommy Cogbill (who played with such singers as Aretha Franklin, Dusty Springfield, and Wilson Pickett) and Chuck Rainey (who played with Aretha Franklin, Quincy Jones, and Steely Dan) are two great session players. Because of this tradition of using session players, you can hear excellent grooves behind some fabulous singers. These musicians are at ease with one another after having recorded a multitude of successful songs together over the years. The bass groove in R & B consists of a fairly active bass part, locked in tight with the drums. Because R & B music often has such a busy bass line — the harmony includes both scale and chord tones — you need a lot of different notes to keep it interesting and not overly repetitive. The use of syncopation — a tied note that anticipates a beat — makes the R & B groove funky. You create syncopation by striking a note when it’s not expected and then failing to restrike the note where it is expected. When playing grooves with syncopation, you anticipate the beat by playing a note sooner than expected. This technique gives the music a kick, like a roller coaster that suddenly drops toward the ground when you least expect it. This R & B groove is in a major tonality. Start this groove with your middle finger to avoid shifting your left hand. 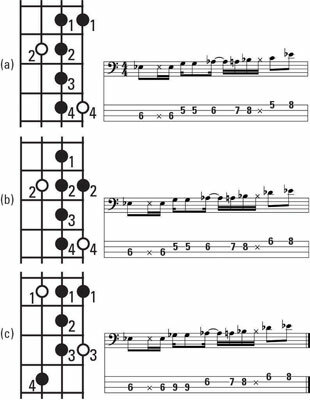 This groove uses notes from the major chord and its related Ionian mode for a major tonality. You can also play this groove as a dominant tonality by playing it as is or by using the ♭ó7 rather than the 6. This R & B groove is in a dominant tonality using the Mixolydian mode. Start this groove with your middle finger to avoid shifting. This groove is based on a Dorian or Aeolian mode (either one will do in this case), and it fits perfectly over a minor chord. Start the groove with your index finger. Listen to these three R & B grooves. You have to listen carefully to hear the subtle difference between the major and dominant grooves; only one note (the second-to-last note) is different. Dead notes and chromatic tones are frequently used in all funk styles, including R & B. This groove utilizes dead notes to make the groove sound busier. To keep your R & B grooves interesting, you may want to start with simple rhythms and notes, and then you can add dead notes and chromatic tones as you get deeper into the tune.